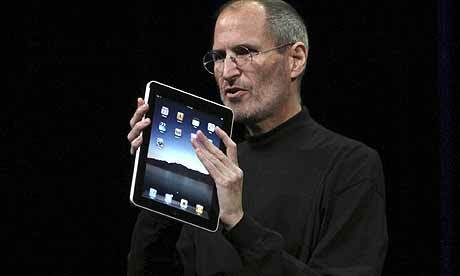 With the introduction of Apple’s tablet, it’s time to take a look at it and size it up. At first glance, it looks like an iPhone or iPod Touch on steroids. It sports the same black bezel and singular home key and it’s shaped about the same, except a bit wider, and of course, much larger with it’s 9.7 inch multi-touch display. Internally, it sports Apple’s new custom A4 processor that packs the cpu and gpu cores along with the memory controller onto a single die. Smart move as far as I’m concerned, as that, along with nearly double the clock speed of a 3Gs makes for a pretty powerful unit. 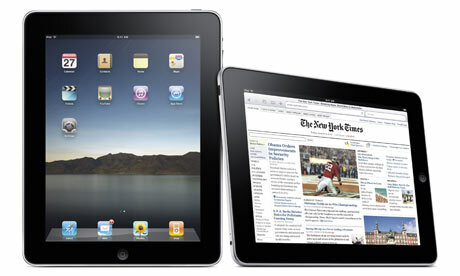 It has the same, innovative and intuitive interface that drives the iPhone and iPod Touch, and it’s none too soon. After playing around with my iPhone for the first 5 minutes, my first thought I had was why doesn’t my computer work like this? With 140,000 apps in the AppStore, and over 3 billion downloads, Apple was smart to make the iPad nearly 100 percent compatible with those existing apps. Not only that, with the new iPad SDK, native apps will soon follow, so there’s already a multitude of iPhone/iPod Touch applications already to go, and newer native apps will take advantage of the added features of the iPad. On the downside, no multitasking, no Adobe Flash support (still! ), no camera and no GPS. I can understand no GPS on WIFI only models, but the 3G models (along with 3G access) should have been able to support GPS. The super portable size and large display would have made for an awesome GPS device…. to bad there, maybe in next year’s model. I think the market here is two fold. User #1: For the non-literate or barely literate computer user, the one who might buy a netbook, the elderly mom, or computer fearing types who typically avoid computers at all costs because they feel they can’t learn how to use it would benefit greatly from it. The netbooks currently available on the market right now are simply super low end, midget laptops, with the standard laptop form factor running an outdated OS. These units are underpowered, and no easier (or harder) to operate than the typical desktop or laptop, so your typical computer fearing types will not get much benefit from today’s netbook. With the easier than easy intuitive iPhone-like interface, even the most computer fearful will find the iPad easy to use with little to no training. User #2: The Power User: The mo’ power, the mo’ betta, that’s my motto. So, you might think someone like me wouldn’t want one…. Wrong. I think it would be great to have a hand held unit like that to relax on the couch with for tackling more simple tasks like web browsing and email, and even some gaming, and leaving the desktop unit for the heavy duty power user stuff like Photoshop, Blender, Second Life, and any other heavy lifting stuff I find myself getting into. Also, instead of owning a full blown high powered laptop, my desktop, along with an iPad for casual web browsing and email and such, along with it’s portability would be great for even a power user like myself, as I don’t need to model weather forecasts or render CGI animations on the run. For portable uses, I wouldn’t need more than what the iPad has to offer, and it’s micro size and relatively powerful (compared to the typical netbook) setup would be fine for mobile computing, even for power users like myself.